This post originally appeared on Van Kane's blog and is reposted here with permission. Monday's presentations brought two pieces of news. 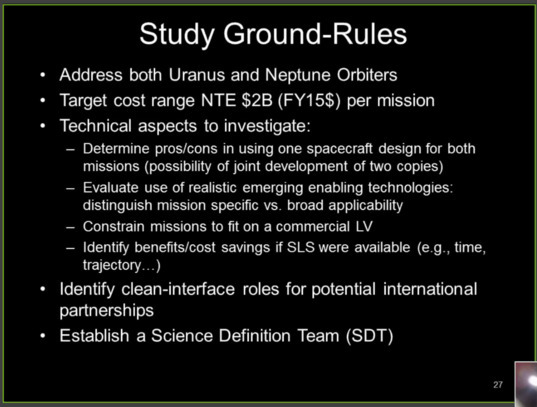 First, in preparation for its Decadal Survey that will prioritize mission from 2023 to 2032, NASA has asked the Jet Propulsion Laboratory (JPL) to review options for mission to Uranus and Neptune. The expectation is that following the large (Flagship) 2020 Mars rover and mid-2020 Europa missions, exploration of these planetary system will be the next priority for large missions. Any missions would likely arrive at these planets a decade or more after their launch. The second piece of new was that NASA has selected two new planetary CubeSat missions. One will orbit the Moon, mapping water ice in permanently shadowed craters in preparation for human exploration. 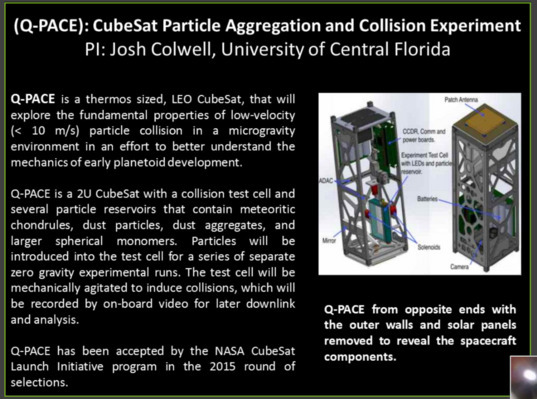 The other will stay in Earth orbit to be a micro-gravity laboratory to study the interactions of particles that eventually led to the formation of the planets. I've placed copies of the slides from the meeting below. As I find out more details, I'll do dedicated posts in the future. 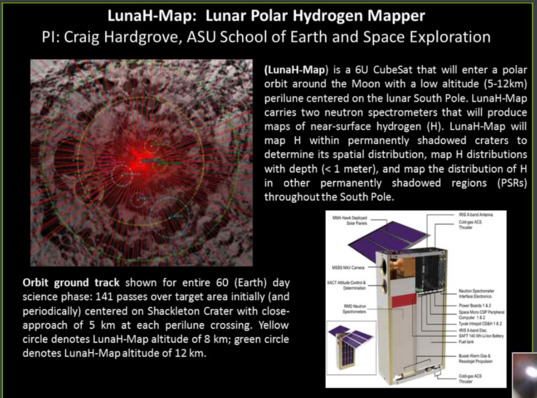 All slides are from Jim Green's presentation; he's the head of NASA's Planetary Science Division. 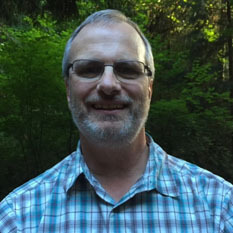 Hi Van Kane; I am glad to hear both that NASA is more seriously considering missions hopefully orbiters for either Uranus or Neptune and their systems for the next decadal survey and also the Cubesat orbiter around the Moon's ice deposits for possible later human lunar exploration. 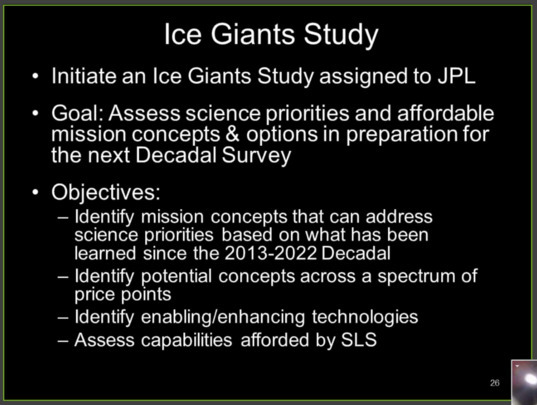 However I was surprised that NASA is doing another decadal survey already. The main thing I remember from the last NASA decadal survey is that exoplanet researchers were very disappointed that the Terrestrial Planet Finder wasn't included under astronomical missions. Although this might not technically be Planetary Science or space exploration do you know if NASA will consider the Terrestrial Planet Finder for the 2023-32 decadal survey as NASA could probably develop the technology and it would lead to great breakthroughs in determining the surface properties and maybe rotation periods of nearby planets including terrestrial ones and better determine is some are truly habitable. What is the time constraint to get an Uranus orbiter that would image the northern hemisphere of Uranus & its moons that was in darkness during the Voyager 2 encounter? According to this article : http://www.astronomy.com/news/2015/08/nasas-next-big-spacecraft-mission-could-be-to-an-ice-giant "Argo, the last proposed mission to Neptune, was grounded because NASA didn’t have enough plutonium to power all of its spacecraft, according to one of its designers. Candice Hansen of the Jet Propulsion Laboratory says there was a special launch window from 2015 to 2020 that would put Argo at Neptune in a decade thanks to gravity assists from Jupiter and Saturn. That timeline is now impossible to meet. " For the record, Argo is a New Frontiers fly-by mission to Neptune. I was unfortunately right when complaining that using scarce plutonium for missions to Mars where is not strictly needed has negative consequences for missions to places that actually do need it. AnimeCharley: Uranus' northern summer solstice will happen in 2028, exactly 42 years after the Voyager 2 flyby, which coincided with the southern summer solstice. We'll be lucky if a Uranus orbiter is even launched by that time. So we'll miss the peak of northern summer by at least 10 years. Fortunately, since each Uranus season lasts 21 years, we should still catch the end of northern summer. We have till the equinox in 2049 to image the northern hemispheres. 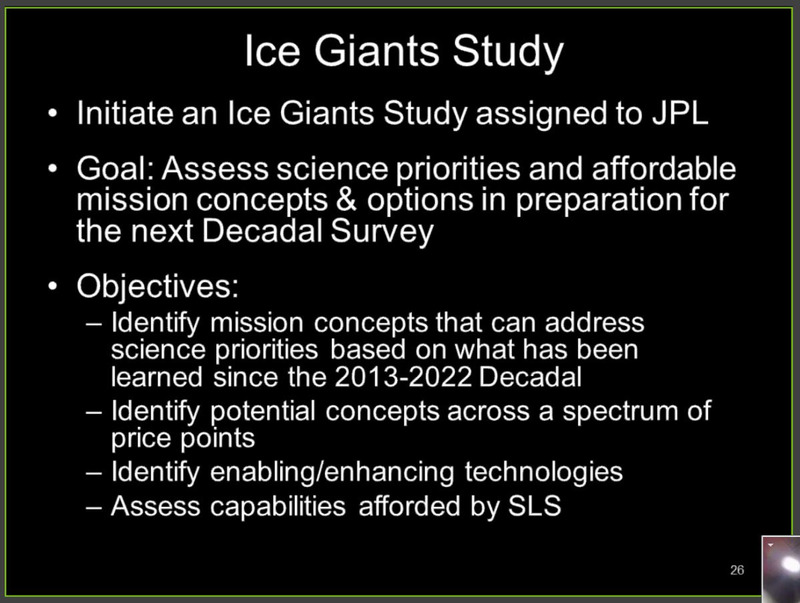 dougforworldsexplr: The next Decadal Survey will be released in about 2022. 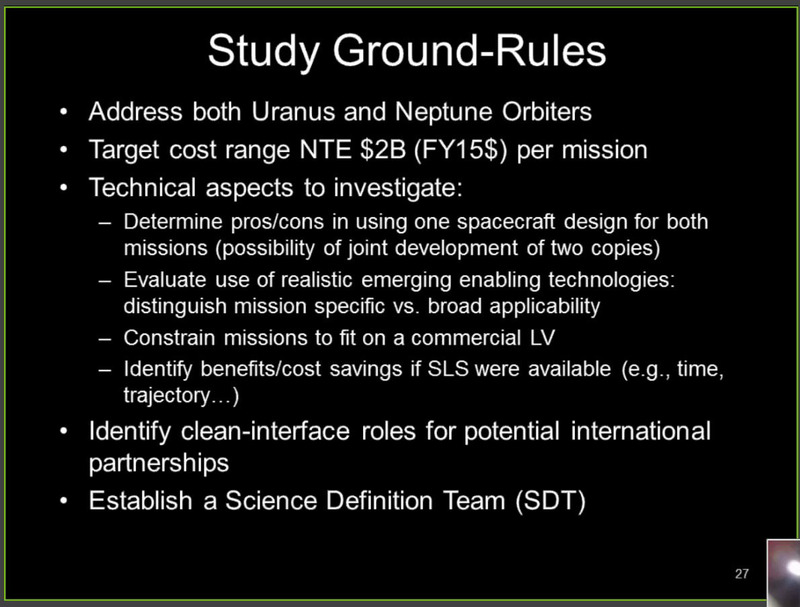 For this, the 3rd planetary Survey, NASA is doing mission studies early in the process. Enzo: The last Decadal Survey considered the Argo proposal. They judged that the additional information that would be gathered using modern instruments during a flyby would not justify the cost compared to other missions. Van, The article is actually quite specific about the lack of plutonium and so is this one from Emily : http://www.planetary.org/blogs/emily-lakdawalla/2008/1729.html "It's a neat idea. It can't happen in the next New Frontiers opportunity because the U.S. doesn't have enough plutonium available for the next New Frontiers to be nuclear-powered." So there was no plutonium, but two Mars rovers got plenty. Solar rovers work well on Mars : Opportunity has worked for over 10 years. ESA's ExoMars will be solar too. I'm sure the RTG is better, but it's a bit as if we can both fly economy to our destination but I fly first class and you stay home instead. As for Decadal Survey, they are at the heart of the bias problem I am complaining about. The very ones that selected MSL-2 over an Europa mission even though 3 other Mars rovers, an orbiter and a lander had already been approved. Whether you call it Decadal Survey or some other NASA's decision process, the reality is that after 2017 there will be no mission to the outer planets, not even on its way. Whereas on Mars, some 3 orbiters and at least one rover are likely to be operating with another on its way. And that damages the Decadal Survey (or whatever) credibility enormously. NASA's Mars obsession directly (by selecting Mars more often) or indirectly (by hogging resources essentials to others) is damaging the scientific exploration of the solar system.